here is my entry, Radio Rover. 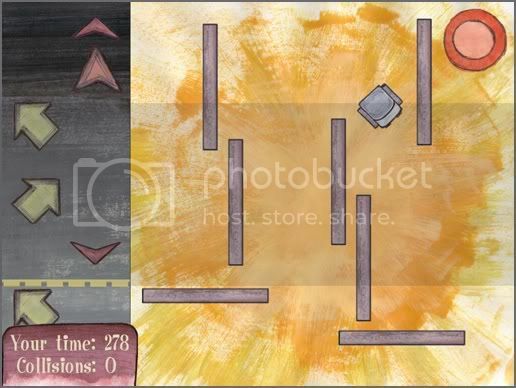 i'm currently expanding the game and working on a port for the Android mobile operating system. any feedback is greatly appreciated. Wow, the arrows go past much faster than I expected. Conversely, the game was really slow to play. The contrast of speeds was a little jarring, and I did get a bit bored playing. The idea is excellent, though, and very worth experimenting with. I wonder what could be done to make it more engaging? Sounds like a very challenging design issue. i was tinkering with the speed of the falling arrows up until the last hour before the deadline. i never found a speed that felt right. at slower speeds, it seemed trivially easy to hit any arrow you wanted. so i have been experimenting with having the arrows fall at variable speeds and with sporadic distances between drops. this seems to be keeping players on their toes a little better. the overly simple goal of the game is contributing to the lack of engagement as well. 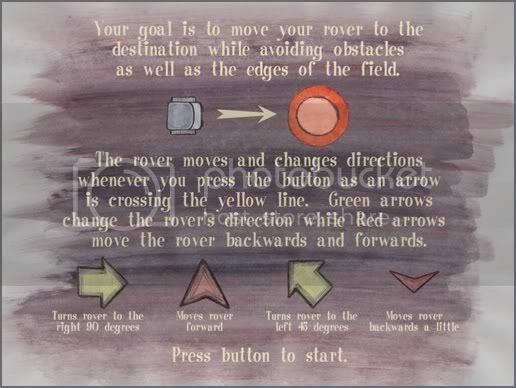 having the player guide a Rover through a maze to a target was the easiest way to illustrate the "Dance Dance Revolution as a means to direct action" idea. but there is no reason that this mechanic has to be limited to just turning and moving the Rover. other actions [such as jumping, firing a weapon, transforming into something else, etc] can be made into icons and fall from the top, intermixed with the existing arrows. the environment does not need to remain static, either. paths can slowly morph and become treacherous or open to reveal opportunities while enemies come bearing down on your Rover. finally, i think this game could benefit from the addition of other human players, each with competitive or cooperative goals. with the above changes in place, i think waiting for [and trying to hit] that one particular arrow or action icon that will turn the tide of the game in your favor would add some much needed tension.